Looks like it broke off final approach into LHR and routed to Stansted. I would expect this to be fuel related after a number of orbits and then a change of stack for more. Weather in NW London has been horrid for the last half an hour - thunder and hail - and looking at FR24 Heathrow stopped any approaches or departures for a time. And now the 685 from Innsbruck is going the same way! Are all these diversions part of the calculation for the environmental impact of a third runway...? 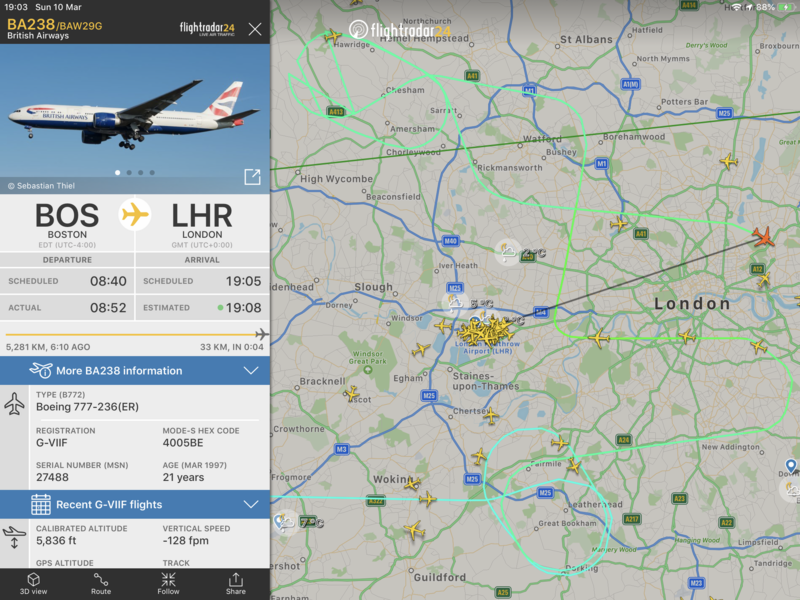 MrsT has just landed at LHR on BA238 from Boston, the approach was broke off due a lightning strike so the crew told them, all safely down now. Similar flight path and altitude profile to the BA749. The TATL presumably had greater fuel reserves than the short haul, therefore could continue to hold for LHR. I guess radio was very busy around EGLL so putting 7700 will get probalby quicker attention from ATC. Perhaps concerns over minimum fuel. nancypants and windchaser777 like this. Yes, if fuel state was getting to the point of requiring a diversion, and the crew couldn’t get in on the frequency because of all the weather avoiding, 7700 could very well be used to attract the controller’s attention. AceReport, LTN Phobia and wrp96 like this. But there would have to be an underlying reason? Collierkr, Crofton138, Scots_Al and 3 others like this. Why wouldn't running out of fuel be a reason? At some point, it becomes an emergency.